Wednesday, May 10. Headed to Sugarloaf Mountain with two goals: get good pictures of pink lady’s slipper and mountain laurel. Failed both. Too late for the former, too early for the latter. Monday, May 15. Headed to Rachel Carson Conservation Park with three goals: locate and photograph large twayblade; get good pictures of spotted wintergreen and mountain laurel. Failed to find the twayblade, too early for the spotted wintergreen, and the mountain laurels were still in bud, with only a few individual flowers open. Tuesday, May 16. 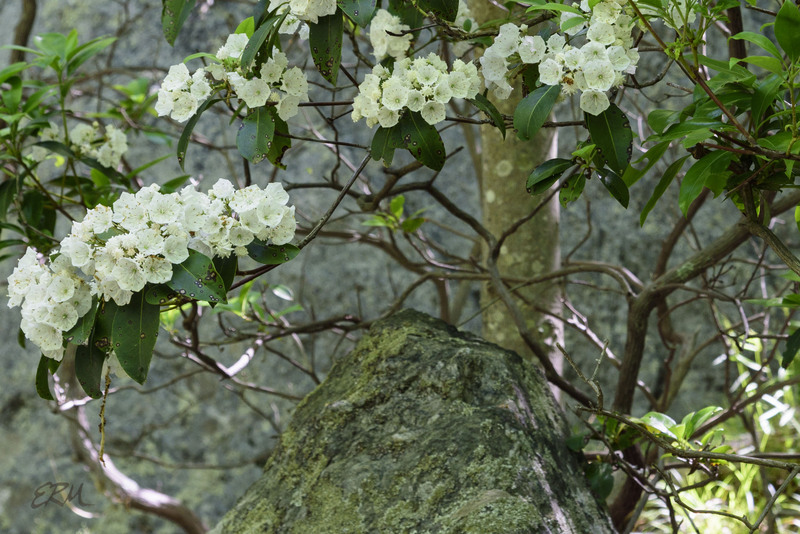 Headed to Carderock with one goal: photograph mountain laurel. Success! Here they were actually a little past peak bloom, but still flowering profusely. 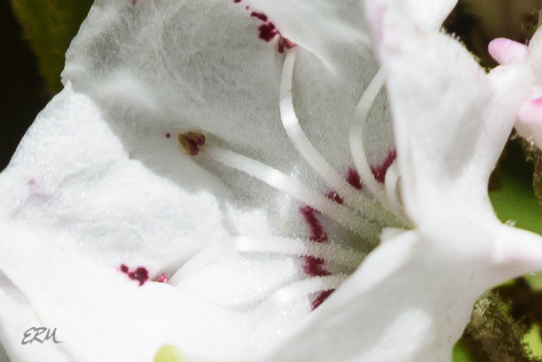 There’s something about the flowers of plants in the Ericaceae (heath family) that I find especially compelling, but I can’t quite put my finger on it. Actually it isn’t just the flowers, because I find the plants themselves intriguing and lovely. 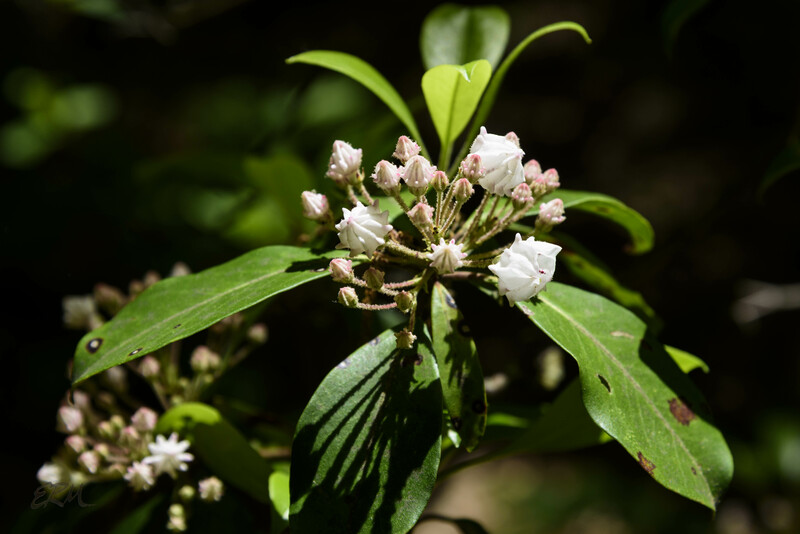 Mountain laurel (Kalmia latifolia) is a multi-stemmed shrub that grows to 15 feet tall, maybe taller in the right conditions, but it doesn’t grow straight. The stems twist and curve, and you can see that habit in the patterns of the bark. It has a tendency to drop all but the uppermost leaves. When in bloom it looks to me like the plant is crowned in flowers. Like our garden azaleas and rhododendrons, mountain laurel flowers on old growth (which you can see in the first photo). New growth is pictured here (with spent oak catkins drooped on the petioles). 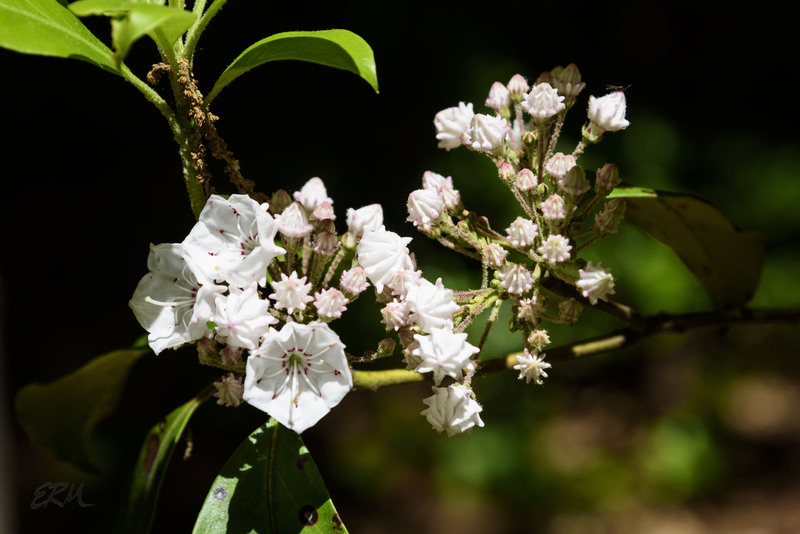 Identifying mountain laurel is easy, because little else has that open, gnarled habit. The leaves are evergreen. 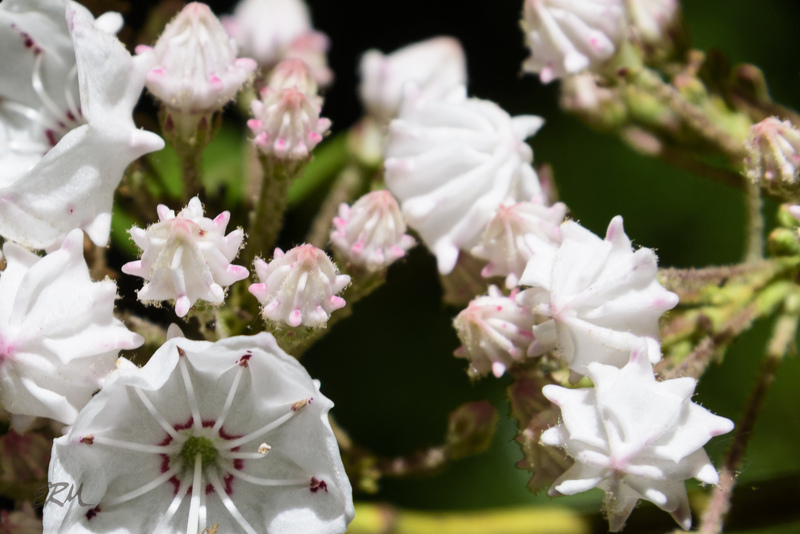 Flowers are borne in crowded corymbs, and each flower has five petals fused into a tube, with ten stamens that initially stick in little folds in the petals. The color ranges from nearly white to deep pink, with a red ring in the throat. 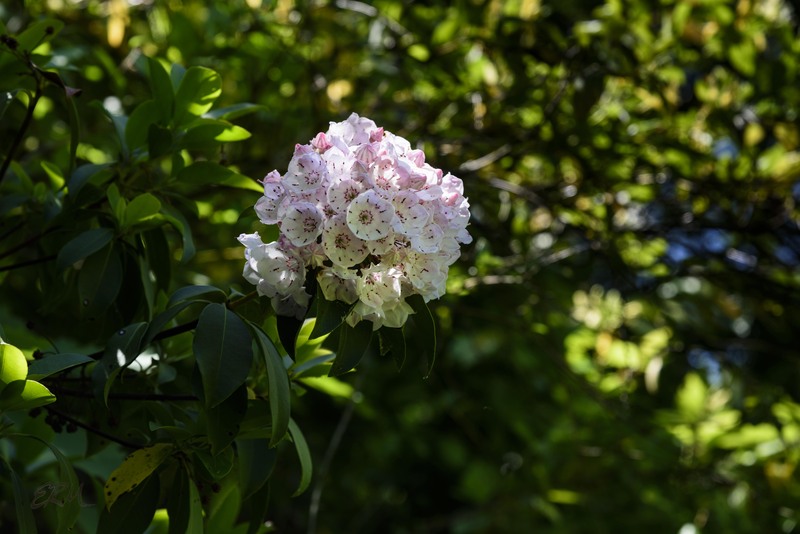 Like other ericaceous plants, mountain laurel loves moist but well-drained, acidic soils. When you see it, you’ll often see other plants in the same family nearby. 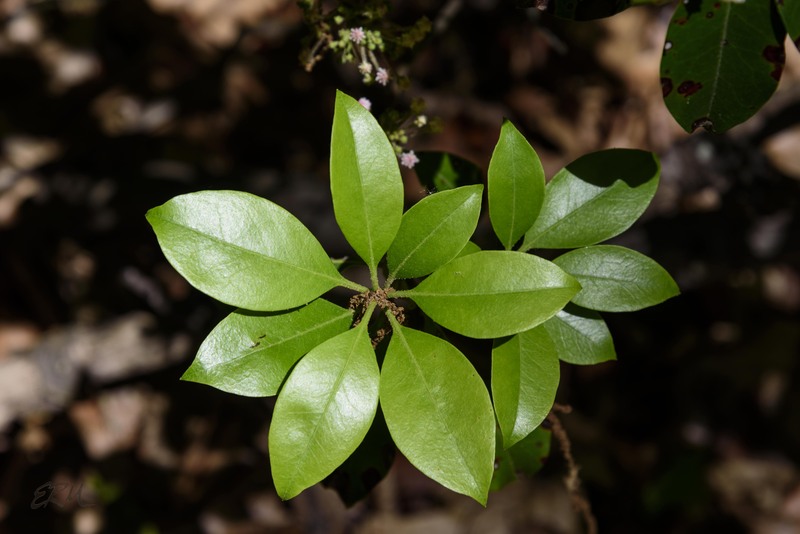 In Rachel Carson Conservation Park, it grows on a bald knob with pinxter azaleas, blueberries and deerberries (Vaccinium species), and spotted wintergreen (Chimaphila maculata). It’s also abundant on Sugarloaf Mountain, and on a few of the ridges near Carderock. There’s a section of the Cabin John Trail that I call Erica Alley, a rocky area with plenty of ericaceous species (and other neat plants, like rock polypody, ground pine, and firmosses), including dozens and dozens of mountain laurels, too, but in all the years I’ve been hiking there, I’ve never seen them bloom. I’ve never even seen buds on them. 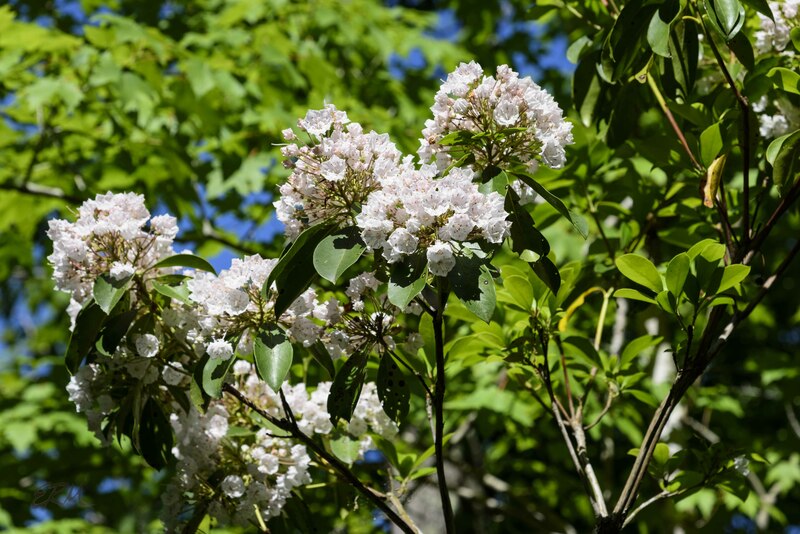 Mountain laurel ranges from Louisiana to Maine; it’s threatened in Florida, special concern in Maine, and exploitably vulnerable in New York. In Maryland it’s found in every county except Somerset. 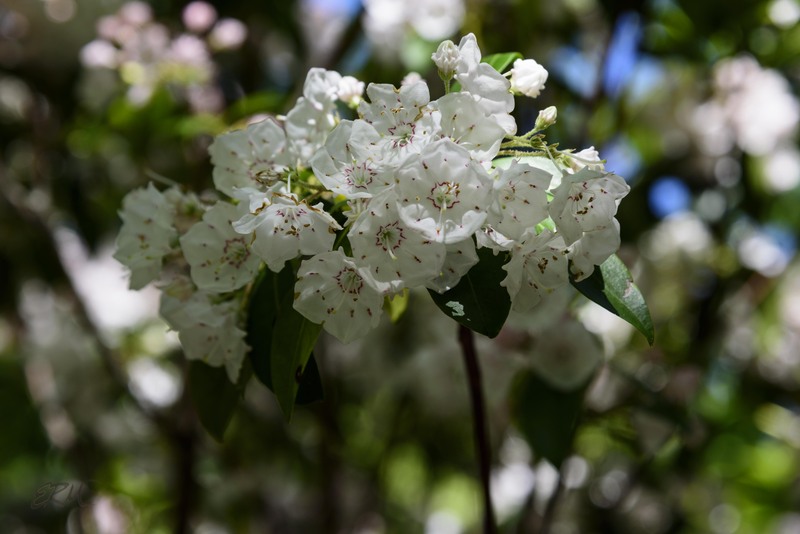 This entry was posted in Uncategorized and tagged Carderock, Ericaceae, kalmia, Rachel Carson Conservation Park, Sugarloaf Mountain by elizabeth. Bookmark the permalink.